Enter the world of secret codes, cunning puzzles, and mind-bending conundrums. 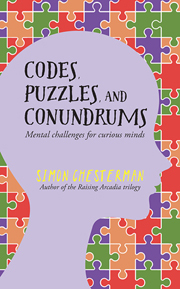 Inspired by the Raising Arcadia series, this book offers a step-by-step guide to each of these three types of problems and a quiz to test your progress. Use it to hone your own detective skills, or to baffle your friends, parents and teachers.